Blog – Page 6 – IT P.E.I. Island Water Technologies (IWT), a wastewater technology company focused on developing renewably powered solutions for remote populations, has secured $250,000 in venture capital from Innovacorp. 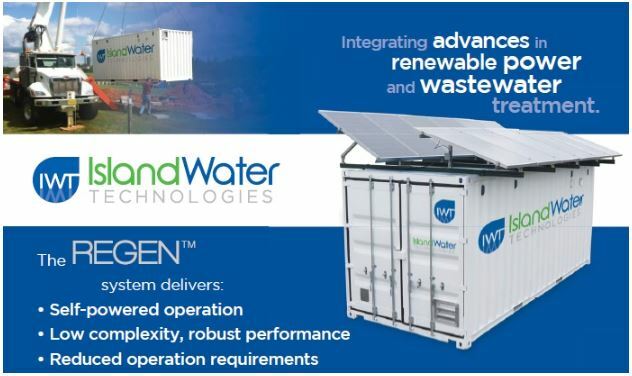 The company will use the investment to commercialize its mobile solar-powered wastewater treatment solution – REGEN. IWT’s REGEN technology has the lowest energy requirement for wastewater treatment in the industry and can be completely powered by renewable energy. The modular systems can be installed in remote locations where there is limited electricity and can be monitored remotely in real-time for ease of maintenance and compliance. The company’s first target markets will be military bases, disaster relief operations, mining camps and off-grid communities. 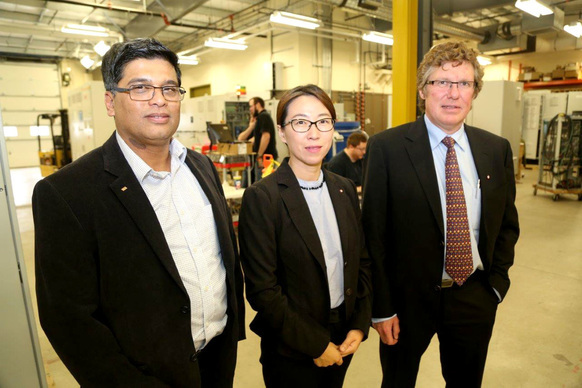 With its head office in Montague, P.E.I., IWT’s research and development is taking place in partnership with Dalhousie University in Halifax and Truro. 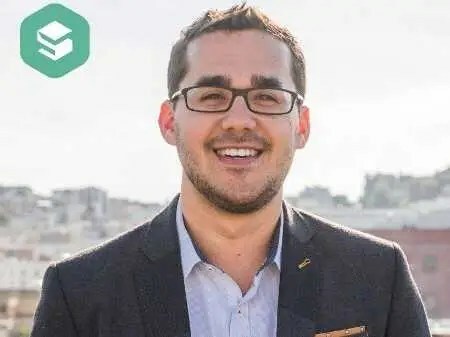 Last fall, the company graduated from Ecofuel, a start-up accelerator run by Cycle Capital, a Montreal-based clean technology fund. In addition to REGEN, IWT has developed two other wastewater treatment products. ClearPod is a drop-in device for residential and commercial septic tanks that speeds up bio-treatment of domestic wastewater and restores performance of existing septic systems. Sentry is a sensor that uses microbes to monitor wastewater treatment systems in real-time and reports through the cloud on the status of biological processes and performance. Comment: Taykey made two senior hires recently: Yaron Waxman as its new VP of product (previously CPO at Showbox), and former Criteo marketer Jon Nevitt as its VP of marketing. The company, which tracks trends for marketers among their desired audiences, has backing from big-name investors including Eric Schmidt’s Innovation Endeavors, SoftBank Capital, and Sequioa Capital. Comments: Sharethrough is a San Francisco-based company that specializes in programmatic native advertising. Comment: Accordant is a media buying and optimization company for agencies and in-house brand marketers. The company has offices in New York, San Francisco, Chicago, and it expanded into London last year. Accordant claims it has achieved a 5-year compound annual growth rate of 65%. The company has appeared in the Inc 5000 rank of the fastest-growing companies two years in a row. Estimate revenues: We are told least $100 million gross, but it’ll be less on a net revenue basis. We couldn’t get an accurate net revenue estimate. 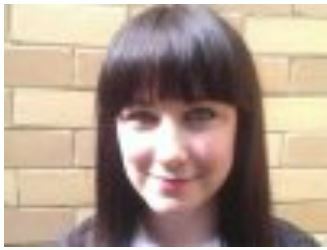 Comment: Kargo’s publisher platform combines content with native brand advertising for mobile. The company has worked with brands including Target and McDonald’s. Kargo says it increased revenue in 2015 by 100% and is forecasting revenue growth of between 60% to 75% this year. Comments: The past 12 months have been busy for video marketing platform Innovid in terms of partnerships. Highlights include partnering with Snapchat to provide advertisers with more detailed data about campaign deliver, offering interactive video capabilities on Instagram and Facebook, and partnering with Roku to power personalized, targeted, interactive video ads. The company also raised a $27.5 million funding round from New Spring Capital, Sequoia Capital Israel, Genesis Partners, Cisco Ventures, and T-Venture. Comment: Deloitte ranked PubMatic as one of the fastest-growing companies in the US for the fourth consecutive year in 2015. PubMatic links this to its 200% growth in mobile advertising in the first half of the year. Mobile now makes up 65% of the volume on PubMatic’s platform. The company laid off 20% of its workforce in December as it refocused the business around the minority of its publishers that drive 90% of its revenue. Comment: Beeswax, which only officially launched in April this year, may only have tiny revenues compared to the other companies on our list but where this firm punches above its weight is its innovative offer. Beeswax is as a “bidder-as-a-service” platform that allows advertisers to custom-build a cloud-based bidder, which undercuts other ad tech companies on price. Its fees start at $7,500 a month, a lot cheaper than the $1 million it would cost to build a bidder in-house. Comment: In September, Socialbakers’ long-time, respected young CEO and cofounder Jan Rezab handed over the reins to Robert Lang, who joined the company from France-based public ad tech firm Criteo. Rezab is now executive chairman. Socialbakers, which is based in Prague, is valued somewhere north of $200 million and it customers include more than half of the global Fortune 500 companies. Comment: LiveIntent is an email advertising company that reaches 130 million people a month. It personalizes the ads inside email newsletters to different audiences. Last year, the company featured in Crain’s 50 fastest-growing companies list for the second year in a row. In June 2015, the company closed a $32.5 million Series D funding round. Captify says its search data network covers 550 million unique users globally. Its clients include Microsoft, British Airways, Barclays, Sky, American Express, and BMW. The company, founded in 2011, is young in many respects: Cofounders Dominic Joseph and Adam Ludwin are aged 30 and 27. Estimated revenues: We don’t have an accurate estimate on net revenues. The company said it achieved a $100 million annual revenue run-rate in Q4 2015, but this is a gross figure (and a run-rate). Comment: In May, Drawbridge raised $25 million in Series C funding that it plans to use to “invest aggressively” in building out its “global graph” that helps it anonymously identify people as they switch between devices. While the primary application of Drawbridge is within advertising, the company is also looking to expand into new areas such as website personalization and fraud detection. The company’s CEO is unusual in ad tech, not only for being a woman, but for her background: She is a former planetary scientist and one of the instruments she helped design during her PhD is currently on the NASA New Horizons spacecraft mission to Pluto. Total funding to date: $152.5 million. Comment: Turn went through a big transition in 2015 and brought its new CEO, Falck, on board last September to help realign the business to focus on brand relationships. Turn claims to be the only independent ad tech company that combines a DSP, DMP, and an analytics platform. Total venture funding: $49.7 million, according to CrunchBase. Comment: Kenshoo is based in Tel-Aviv and is best-known for handling billions of dollars worth of search, local, and social media advertising spend. The company is a Facebook Marketing Partner and in 2015 was granted initial access to the Instagram Ads API. Estimated revenue: Forbes reported Sprinklr surpassed $100 million in annualized revenue last fall (without indicating gross/net), so we of course expect more than $100 million this year as an apples-to-apples comparison. We couldn’t get closer to a net estimate. Comment: Sprinklr is an enterprise software platform that lets brands like Nike, McDonald’s, Microsoft, and JPMorgan Chase manage their organic and paid-for social media marketing in one place. In the past 12 months, the company has made a number of acquisitions: Social visualization platform Postano; location-specific text analytics software firm NewBrand; and audience segmentation platform Booshaka. Estimated revenue: The company said it was on track to achieve $200 million in revenue in 2015, although this is likely a gross revenue number. We were unable to estimate an accurate net revenue figure. Comment: Last June, RadiumOne secured $54 million in Series C financing, which it said it planned to use in order to open up more officies across Asia-Pacific and Europe, expand its data and platform technology, and fund more sales and marketing hires. The company says it achieved record growth and net profitability in 2015. 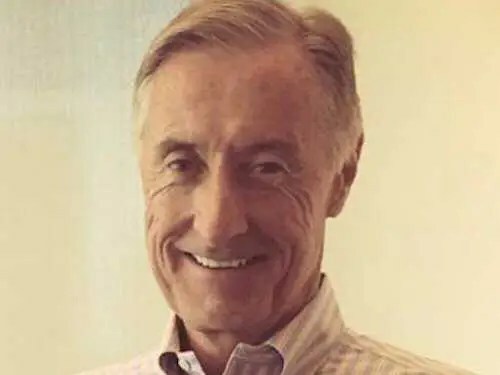 It seems like RadiumOne is finally shaking off some of the negativity associated with the ousting of its former CEO and founder. Estimated revenues: The company told TechCrunch its revenues were $167.5 million in 2014, up from $100 million in 2013, without indicating net or gross. We were unable to get closer to a 2015 net revenue estimate. Comment: DataXu (pronounced “data zoo”) is a marketing analytics platform that works with more than 700 brands around the world. The company tells us it has seen topline revenue growth of more than 350% in the past three years and that it is profitable. In January this year, British pay-TV provider Sky invested $10 million in the company. Comment: Often referred to as an “ad blocker-blocker,” Sourcepoint is actually attempting to become the “Spotify for digital content,” offering publishers a toolkit to attempt to thwart the threat of ad blocking. 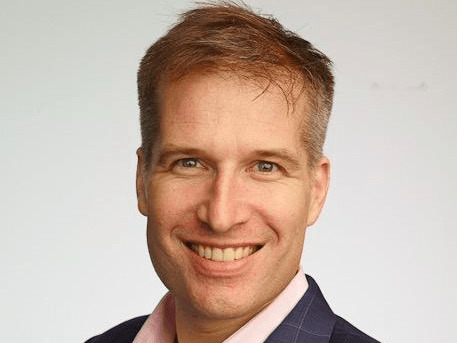 Sourcepoint’s investors are the “who’s who” of the ad tech community: Former Millennial Media CEO Michael Barrett, MediaMath CEO Joe Zawadski, Moat CEO Jonah Goodhart, and LiveIntent CEO Matt Keiser. Spark Capital, Foundry Group, Greycroft, and Accel Partners Europe, are also investors. Comment: PageFair has helped move ad blocking up the global agenda this year, thanks to its report (published in partnership with Adobe), which estimated there are 198 million people using ad blockers worldwide. As well as providing technology to help around 5,000 publishers establish the size of their ad blocking audience and find a way to serve non-intrusive ads to them, PageFair has also helped coordinate roundtables in the US and Europe between agencies, publishers, advertisers, ad blockers, browsers, and consumer groups to help address some of the issues ad blocking has raised. Comment: In 2015, WideOrbit, which was primarily known as a traffic software company for TV broadcasters and cable networks, launched its programmatic TV product. The company claims no other programmatic TV platform matches WideOrbit’s scale: It can reach 80% of US households and 20 of the top 25 media markets. Comment: AppLift is a Berlin-based company that helps mobile app advertisers acquire and re-engage users. It works with the biggest players in mobile apps including King, Zynga, and Glu Mobile. AppLift says it marked 170% “profitable growth” in 2015. It also acquired Singapore-based mobile demand-side platform Bidstalk. Comment: AdRoll claims to be the most widely-adopted independent programmatic advertising platform, with more than 25,000 customers. In the past year, the company has launched opt-in data co-operative AdRoll Prospecting, launched email retargeting service SendRoll, and the company expanded into Japan. Estimated revenues: $400 million gross revenue in 2014 (the last time figures were published). We were unable to estimate an accurate net figure. Comment: InMobi is an India-based mobile-only ad network that claims to reach more than 1.6 billion active users. In 2015, InMobi launched a new product and service recommendation platform called Mipp, which the company says is helping transform mobile advertising into a discovery experience so users can be inspired to buy items on impulse. Estimated revenues: We estimate between $130 million and $150 million net. Comment: Centro, which sells digital media management software, had a busy year. The company raised $30 million in Series B funding, led by Neuberger Berman Private Equity Funds. It also acquired GraphScience, an automated social ad-buying platform. The company did also layoff around 4% of its workforce in December, but it said these happened because it wants to remain profitable (Centro says it has been profitable in every year since 2001, except for 2008) and sustain its tech investments. Comments: Teads is a video advertising specialist that claims to have invented the outstream video advertising format. The company says it grew revenue 50% year-on-year in 2015, with a big focus on programmatic revenue, which grew 300% in the period. We also hear they’re a hot acquisition target, possibly from a public company. Comment: Advertisers use Integral Ad Science to ensure they are forking out on ads that are in safe media environments with actual humans (rather than bots) viewing them. The New York-based company was listed as the fast-growing company in North America on the Deloitte Technology 500, Crain’s Fast 50, Inc’s list of America’s fastest-growing private companies, and Forbes’ list of America’s most promising companies last year. In addition, the company also raised $27 million in funding. Comment: In 2015, Quantcast launched its first programmatic brand solutions suite, which includes new products Search Powered Audiences and Audience Grid. 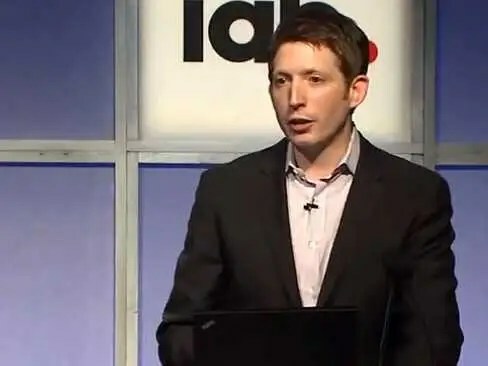 The company also hired the former CIO and CFO of DoubleClick Stephen Collins as its president and CFO and Google’s former director of people operations Sandra McDevitt as its VP of people and places. Comments: IronSource is a Tel Aviv-based mobile ad tech company, offering user acquisition, conversion, monetization, analytics, and optimization tools. In September last year, IronSource announced a merger with mobile ad firm Supersonic, which it says formed the “largest independent mobile monetization and marketing platform offering real scale.” IronSource claims to reach more than 800 million unique mobile users a month. IronSource closed a $100 million round of funding in February last year, which was reported to value the company at $1 billion and set it up for going public — although that IPO has not yet materialized. Comments: Outbrain is one of the biggest content recommendation platforms. This year, the company acquired Los Angeles-based software firm Revee to help launch a new product that claims it will let publishers know exactly how much individual articles are generating in revenue, in real time. Outbrain also launched a chatbot that lets publishers launch apps on messaging platforms, with CNN signing up as its first partner. Comments: Taboola is transitioning from being a pureplay content recommendation service, to a platform company that provides publishers with tools to personalize pages to each reader and serve native ads. The company signed big deals with the likes of AOL and MSN in the past 12 months and it raised a multi-million dollar funding round from China’s largest search engine, Baidu. On the content recommendation front, Taboola says it now reaches 1 billion users a month across desktop and mobile. Estimated revenues: Last we heard (in 2014), it was nearing $300 million, although that is likely a gross revenue figure. We were unable to estimate an accurate net revenue figure. Comment: This year, Videology has been making a great amount of noise about the work it is doing to stamp fraud out of the ad market — the company said it had blocked more than 28 billion fraudulent bot requests, in partnership with White Ops. The company did also let go of around 8% of its workforce in January as it reorganized the business around its enterprise and TV deals, AdExchanger reported. In the last year it signed enterprise partnerships with the likes of Adobe, AT&T AdWorks, Sky, and Everyday Health. Comment: In June 2015, Mediaocean sold a majority stake of the business to Vista Equity Partners, in a deal that valued the firm at around $720 million. Highlights of the past year include acquiring BCC AdSystems in Australia to support its Asia Pacific business, partnering with Rubicon Project to offer a automated guranteed solution for its direct advertising business, and hiring industry veteran Ramsey McGrory as its CRO. Comment: Moat provides third-party viewability, measurement, and analytics across platforms including Facebook, Twitter, and YouTube. Plus, it also has a close partnership with Nielsen, which is the company that provides TV ratings data in the US and is increasingly providing online video ratings too. Away from advertising, Moat also provides content analytics across a number of major platforms. When we asked ad tech insiders who should appear on our list, Moat’s name kept coming up. In May this year, the company raised a $125 million credit facility led by Citibank. Comments: In 2015, OpenX said it generated $140 million in net revenue, up 40% year-on-year. The company says it was also profitable and marked 100% year-on-year mobile revenue growth. Another highlight of last year was ranking top of Pixalate’s Global Seller Trust Index — which rates exchanges based on the quality of their ad inventory — for six consecutive months. Comment: MediaMath is a US-based demand-side platform, which launched in 2007. Last year, the company was named in the Deloitte Technology Fast500, which ranks tech firms based on their revenue growth. MediaMath acquired Spree7, a German programmatic ad company in November last year. In August the company appointed new execs and board members and was said to be “looking at all options, including going public and staying private,” AdAge reported. Business Insider hears a number of public companies have eyed up MediaMath for a potential acquisition, but it sounds as though the company wants to remain independent for now. Comments: Highlights of 2015 included the acquisitions of YieldEx and Real Media Latin America. AppNexus also became Microsoft’s programmatic ad platform in 57 markets around the world. More recently, AppNexus announced it was partnering with video ad tech firms including Teads and StickyAds to create an “outstream open video marketplace” — selling video ads that appear and automatically play (without sound) on a page as a user scrolls through an article. WPP often name-checks AppNexus in its earnings. The advertising holding company made a big investment in AppNexus in 2014. Revenue: This is one of the most important factors in our ranking. Companies with robust businesses have revenues they can talk about in dollars (not blind percentage “growth” claims). Companies that are modest about their revenues are usually modest for good reason. We tried as hard as possible to obtain net revenue estimates. We are not auditors and we don’t have access to the companies’ accounts, so we have had to rely on our own reporting, that of other publications, estimates from industry experts, and figures given by the companies themselves. This ranking shouldn’t be looked at as an exact science, but more a temperature check of how companies are performing. Total employees: Companies tend to hire more people because they’re handling more business. Headcount is a good proxy for growth — although having too many employees can drive down margins and veer companies away from their core focus. Funding: Investors tend to want their money back. So companies that have taken a lot of investment funding are under greater pressure to IPO/exit than those that have not. VC investment is also an indicator (although not the indicator) of confidence in a company. Reputation: It’s great that some companies like to grow quietly without the distraction of the media spotlight (some even requested we didn’t put them in the list) — unfortunately that means we’re less likely to know about them. But, as previously mentioned, we also asked industry experts for their suggestions on which companies should feature, so we could get a good mixture of those companies with a good PR machine and those that are a little more off-the-radar. Inevitably, we will miss a few companies that should have been on the list — but we hope this is a good reflection of some of the most exciting startups in this space. Vector marks 25 years of aerospace success on P.E.I. Jeff Poirier embodies the Vector success story on Prince Edward Island. He started at the company in 1993, straight out of the Accounting Technology program at Holland College. 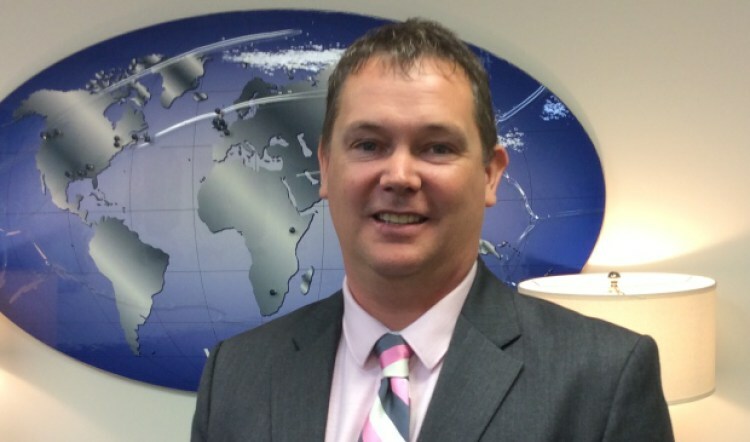 Now Poirier is President of Vector Aerospace Engine Services – Atlantic. Vector, then known as Atlantic Turbines, was one of the first tenants at Slemon Park in 1991, starting with just four employees. The company specializes in the maintenance, repair and overhaul of gas turbine engines. Jazz and Pratt and Whitney Canada are among its biggest customers. “Standing where I am today as the president of 475 people, touching as many engines in a week as we touched in the first two years with customers around the world, I think it’s safe to say we’re not here for a short time,” said Poirier, with a smile. In 2015, the company also signed a long term lease with Slemon Park to stay at the facility to the end of 2030. Part of Vector’s success, according to Poirier, lies in its deep P.E.I. roots. More than 90 per cent of the employees are Islanders. “Considering I grew up 15 minutes down the road, in a little place called Grand River, it’s almost like a dream come true every day,” explained Poirier. The company has attracted Islanders to return home with the promise of stable, year-round employment. “That’s a core DNA for us to ensure we can employ many good Islanders,” observed Poirier. Vector gets good reviews from its employees. In 2016, it was named one of the Best Places to Work in Atlantic Canada, earning the distinction for the second year in a row. Clifford Gallant is supervisor of the inspection department and has been at Vector for 15 years. He’s originally from Miminegash and his brother also works for the company. Gallant joined Vector after completing the gas turbine technician program at Holland College. “I thought it was a great opportunity for a career and sustainable employment,” said Gallant, adding that he would likely be working in fishing or farming if he hadn’t found aerospace. Krista Lightbourne-Storr is a Holland College graduate originally from the Bahamas. She and her husband both work at Vector. Krista Lightbourne-Storr works in sub-assembly. She and her husband are from the Bahamas, where Holland College does extensive recruiting. The couple did their on-the-job training at Vector and now have full-time jobs. They’re now recruiting friends and families to join them on Prince Edward Island. “I have two persons who are going to take the course in September who I’ve recruited to come as well as there’s another Bahamian who will be joining shortly to the company,” said Lightbourne-Storr. Rodney Barbour, who has been with the company since 1998, says he probably would have ended up going out West if it hadn’t been for Vector. A 2015 consultant’s report prepared for the Aerospace and Defence Association of Prince Edward Island reported that P.E.I.’s aerospace workforce receives wages 22 per cent higher than the average P.E.I. worker. “I think just having the security,” added Rodney Barbour, assembly operations supervisor, who has been with Vector since 1998. “We operate in seven different jurisdictions around the world and the tax holiday that we enjoy here from the provincial government is an added bonus,” said Poirier. Vector executives also point to federal and government support for the company projects, such as the construction of a new facility for testing engines. Vector Aerospace expands, commits to P.E.I. Vector’s success has also inspired a spin-off. Islander Dave Trainor returned to P.E.I. in 2008 to set up Action Aero, based in a large hangar on Belmont Street in Charlottetown. Vector has remained their number one customer though they now do work for companies around the world. “At that time, they [Vector] were sending most of their engine accessory work into various companies in the United States to get it repaired and overhauled and that was my background so I thought it would be a great fit for us to set up a company locally to support them,” explained Trainor, who now employs about 36 people. Trainor set up Action Aero in Charlottetown instead of in the Summerside area in part because he didn’t want to compete with Vector for employees in the western end of the Island. “When we opened up in 2008, very few people in Charlottetown or east, knew there was an aerospace industry,” said Trainor. That lack of awareness posed a problem for Trainor, who started working with local high schools, giving presentations and offering tours. The company also welcomed students to come in as part of the co-op program. “We’ve been able to fill our supply chain of future technicians through that program,” added Trainor. Trainor suggests that the aerospace sector as a whole needs to do a better job of raising awareness of what it offers. Everyone who lives on Prince Edward Island knows the power of word of mouth – whether good or bad. For businesses, word of mouth can make or break you. Every business owner knows technology and social media has magnified the devastation of a bad review gone viral. That’s where Charlottetown company BamText comes in. BamText allows customers to communicate feedback instantly to a company. Whether it’s a rave review or an unforgiving pan, this mobile comment card allows a person to immediately and anonymously send a text message on a unique local number – hopefully before airing a grievance on Facebook. Ninety six per cent of text messages are opened and read within minutes. We wanted to offer a way for businesses to rectify an issue and for customers to give feedback right away. Fraser and co-founder Keir Pollard started building their company 26 months ago as a sideline to their other jobs. They didn’t want investors, they wanted to try to make it on their own. We knew these products were selling, but to really get off the ground we needed these (government) programs. They realized they were really onto something and were awarded a $25,000 grant from the Government of Prince Edward Island’s Ignition fund. At that point, Fraser decided to quit his day job and make a go of it. “We were bootstrapping it,” Fraser said with a laugh. “We knew these products were selling, but to really get off the ground we needed these (government) programs,” he said. 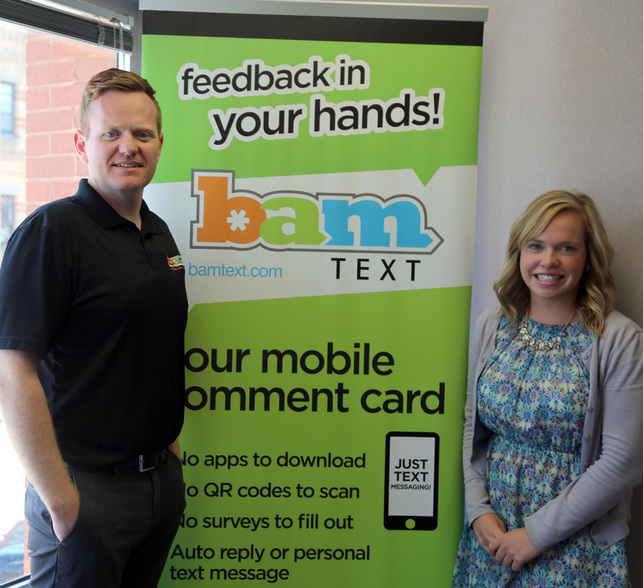 As business continued to grow, BamText took advantage of the government’s Graduate Mentorship Program to hire UPEI Business grad Megan Murnaghan to do sales. The program paid 70 per cent of her wage for the first year. They now have seven employees and will be up to nine by the end of the year. The company has grown from 40 customers to 400, recently landing Irving Oil North America as its biggest client. Irving representatives saw a BamText poster on some Northumberland Ferries Limited ferry and were intrigued. “They called us, we didn’t call them,” Fraser said. The deal means BamText will be offering their service at hundreds of Irving Oil and Circle K’s across Canada and the United States over the coming months. Fraser and Pollard also just learned BamText has been chosen as a recipient of the provincial government’s Development and Commercialization Fund so they can go even further. Their goal is to build their customer base from 400 to 4,000 in the next few years. Jill and Brian Burridge were working for a Western Canadian company in Alberta when their first child was born and the magnetic pull of the red Island soil got stronger and stronger. Jill (Cheverie) Burridge, a Holland College grad who got an engineering degree from UNB, wanted to be closer to her family in Souris and Brian, a New Brunswicker she met at university, was game to make the move too. They had spent nine years working for Midwest Surveys as engineers offering survey work for oil and gas, private citizens and construction companies. We decided it was time to get back home so we proposed this to our president. In 2013 they made the move east and set up a satellite office in their Stratford home. Now working on Island time, the Burridges would start the day at 7:00 am. Doing so gave the company a big head start on the competition in the west while everyone there was still sleeping at 4:00 a.m. 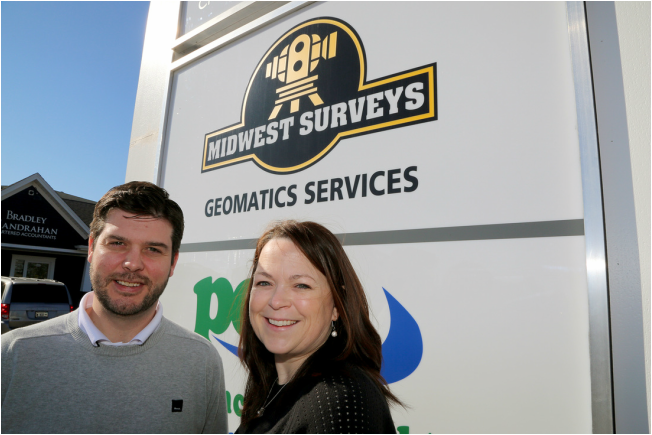 In this way, Midwest Surveys could offer a quicker turnaround to beat its competitors. Two years later, the Burridges were ready to expand and set up an office so they reached out to the Prince Edward Island government. Through the Launch Pad program, government helped them set up their office on the main strip in Stratford next to the vet clinic and offered wage subsidies to hire staff for the first year. Officials from provincial government also visited their headquarters in Calgary, Alberta to discuss the satellite office in Stratford. The expansion to PEI has gone well. One of the company’s office employees had been traveling to Fort Mac to work and spending most of his time away from his young son. He is now living and working at home on PEI. “We are happy to get some of those guys home,” Jill said. The Midwest Surveys office is equipped with Microsoft Link for daily conference calls from its Stratford boardroom to the Calgary one – after noon PEI time, of course, when Western colleagues arrive for work. They’re two Commonwealth Islands, separated by 3,700 kilometers of water, with one nearly at the Arctic Circle, the other, the equator. But in an office in downtown Summerside, PEI, staff is busy helping a Barbados company manage and organize their employees’ vacation, sick time, benefits and pay. For the past few years, Worklinks has been working hard to establish trust and rapport with several Caribbean countries where the PEI company is expanding its reach. Its latest client, Williams Industries, is based in Barbados, owning 20 companies across the island in industries ranging from manufacturing to retail. Barbados wasn’t on Worklinks’ radar until the PEI government connected them with the country’s High Commission and provided the opportunity to visit the island, through the support of ACOA, Innovation PEI and the Trade Team PEI via the trade mission initiatives. Thanks in part to the success of these missions, there are now eight staff at Worklinks, and they’re planning to hire more. Many global companies have operations in Barbados due to the availability of a highly educated population and the government’s efforts to ensure enough good jobs to keep them there. “We’re expecting to land more sales as a result of the latest mission; our repeated visits to the island are a signal that they can trust us, that we’re there to stay,” Gaughan said. We’re expecting to land more sales as a result of the latest mission; our repeated visits to the island are a signal that they can trust us, that we’re there to stay,” Gaughan said. “Our efforts there are really starting to gel. A trade mission to India last February with the premier is paying off for Aspin Kemp CEO, Jason Aspin. The engineering and manufacturing company, with corporate headquarters in PEI, provides power and control systems to marine and offshore industries. The company’s approach and innovation caught the attention of an Indian IT business they met. Grintex India Limited, which specializes in ship design, homeland security, aerospace and space industry and air traffic control, was interested in a second meeting, so Aspin and his Finance Director Ravi Naidu travelled back to India in March. The second meeting went so well that the two companies signed a memorandum of understanding witnessed by the premier during their third meeting just last week in the Aspin Kemp office in Stratford, PEI. Premier Wade MacLauchlan made himself available on a moment’s notice to witness the deal. A small company like us is on the radar here. We can adjust and move fast as things change and PEI can too — it’s a good match for us. Aspin Kemp employs more than 150 people from around the globe on Prince Edward Island and has locations in Singapore, Texas, Nova Scotia and Ontario. They’re rapidly expanding their reach and growing the business. “Most of our business is in Asia,” says Aspin, whose wife Chunying Li, is an engineer and the company’s director of operations. The two met in Singapore and she agreed to make the move back to his Island home. The couple lives in Charlottetown with their two children. This latest deal with Grintex is just another win for the successful company which relocated its headquarters to PEI three years ago. I can hop a flight to Toronto and be anywhere in the world from here a lot easier than I could dealing with traffic in Hamilton. He and his staff appreciate the Island lifestyle, low cost of doing business and the ease to reach foreign markets. “I can hop a flight to Toronto and be anywhere in the world from here a lot easier than I could dealing with traffic in Hamilton. Government programs such as the labour rebate and provincial tax incentive for marine-based companies have been, and will be, their two biggest supports, he said. “Innovation PEI has been really helpful to us. I want people to know the Island is open for business. It will offer you a lot more than expected. It has advantages over any place in Canada or the world. Companies thinking about setting up really need to take a look under the hood here in PEI,” he said. Andy Roberts, director of product development at the studio, explained that the game is his small, but mighty, crew’s most ambitious project since the company was founded in 2012. “This is the most adventurous game that we’ve done yet and we really want that to be our calling card. This is what a small team can do and this is what we’re capable of as a company,” said Roberts. The game itself is akin to checkers, with the object being to send your pirate crew from your ship out onto a net grid connecting it to your opponent’s vessel. When two pirates encounter each other the aggressor knocks the defender off the grid. Whichever player completely decimates the other’s crew, wins. There are also various items and bonuses players can use to give their sprightly crew an advantage. Users can play against an artificial intelligence, locally on the same device with a friend or over the Internet. The game itself is free, but there are in-game, real money, purchases and advertisements. “Rapscallions” will appear on the Android store by the end of this week, while the iTunes version will appear, hopefully, sometime within the next couple of weeks. Unfortunately, they can’t be more specific regarding release dates, said Roberts, because once the company submits the game to the distributor even they don’t know exactly when it will work its way through their system and be posted. The company currently employs five people and operates out of the Holman Centre. 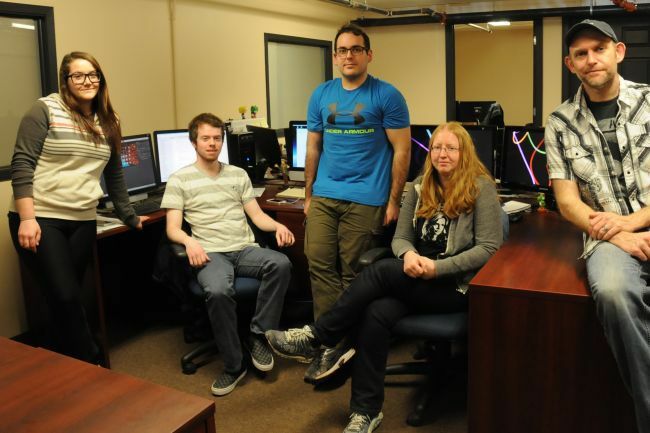 As far as they know, they’re the only company developing video games in the Summerside area. The fact that they exist might surprise some people, said Roberts, as the company tends to have a low profile. But they try to stay active in the Island’s small game-development community, which has about half a dozen members, take on students when able and generally trying to support the industry. James Martin, one of the programmers, said he grew up wanting to work in the video game industry but always assumed he’d have to move away. However, an information technology expo he attended in Grade 10 surprised him with the amount of options he had locally. He ended up being hired by Funky Finger right out of UPEI’s computer science/game programing program and moved to Summerside from Charlottetown. “Rapscallions” will be the first game Martin has worked on with an actual studio and he’s proud of how it turned out. “I’ve never released anything through a company yet, so it’s pretty exciting,” he said.